Unlike any other day dedicated to a patron saint, St Patrick's Day has become a worldwide phenomenon. For some, it's a day which invites us to let loose and party till we drop, for others it's like any other day, but no matter how you see it, everyone knows the iconic symbols that come with it. It's a day that has quite the heritage, adopting many Irish and Celtic symbols and themes that have become as famous as the day itself. But have you ever wondered what these symbols mean? Or where they came from? Let's take a look. Perhaps the most famous symbol of St Patrick's day is the Shamrock; a clover like plant that's one leaf off being the most famous symbol of good luck in the world. St Patrick used Shamrocks in his religious teachings and as such they were seen as holy plants by many of the Irish population. What started as a simple teaching tool, the Shamrock has since become one of Ireland's national symbols. It later became an Irish symbol of luck, and has since grown to become one to the world itself, so it's no wonder why you'll see people all over the world donning shamrock hats, jewellery or even a pair of clover shaped glasses! In a fun little twist for all you history buffs out there, would it surprise you to know that the colour of St Patrick isn't green, but blue! But now we have green everything to celebrate St Patrick: green clothes, green jewellery, green hair, even green beer! So how did this come to be? Well Ireland is known as the Emerald Isle, because of how green it is all year round. As a result, it was adopted to the national flag and has blossomed into becoming the national colour of Ireland itself. Plus, Shamrocks are green and as they're considered good luck, so is their colour. So by wearing green on St Patrick's Day, not only are you paying tribute to Ireland, but also bringing yourself some good luck! St Patrick's Day as we know it today was actually started by our friends across the Atlantic pond. It all began when much of the Irish population began to migrate over to America in search of a new, better life. Of course, being in a new land must've been quite strange and naturally they wanted to keep in touch with their heritage, so they begun to celebrate St Patrick's Day in style not only to remind themselves of where they came from, but to introduce their culture to their new neighbours. Today, those values are still held as however you celebrate the iconic day, there's no denying that it brings people together. While there are many Irish snacks to try on St Patrick's Day, corned beef and cabbage has now become the staple meal for the day - much like Haggis on Burns Night, or Beef Wellington for St George's Day. However, only cabbage is native to Ireland itself but because Irish immigrants living in New York couldn't afford bacon, which was the more traditional pairing, they had to make do with corned beef. While many see St Patrick's day and the mischievous little Leprechaun as going hand in hand, this association is incredibly recent. In Celtic folklore, Leprechauns are actually a lot crankier and liked to play tricks on people more than anything, quite the opposite of the friendly, luck giving creatures we've come to know them as today. This change in view can be credited to Walt Disney productions who in 1959, released the film Darby O'Gill and the Little People which introduced the world to the good humoured, friendly, luck giving little guys who have since become part of the St Patrick's Day lore. You could say that overall, St Patrick's Day is a lucky day. 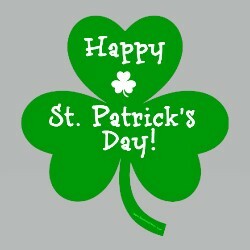 So don your shamrock hat, put on a green top and bring yourself some good fortune with cashbacker! We can direct you to some of the best bingo and casino sites, as well as help you earn cashback as you play! What better way to celebrate than that!